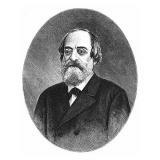 Constantin Alexandru Rosetti (C.A. Rosetti) (2 June 1816-8 April 1885), was a Romanian Freemason, literary and political leader, born in Bucharest into a Phanariot Greek family. In 1845, Rosetti went to Paris, where he met Alphonse de Lamartine, the patron of the Society of Romanian Students in Paris. In 1847, he married Mary Grant, the sister of the English consul to Bucharest, Effingham Grant. The consul was married to Zoia Racovita, the daughter of Alexandru Racovita; the Grant Bridge (Podul Grant) near Gara de Nord in Bucharest is named after him. Rosetti took part in the Wallachian Revolution of 1848. He was among the first arrested by Prince Gheorghe Bibescu, who accused Rosetti of plotting to kill him. After the provisional government came to power on June 11, 1848, he held the post of chief of police. He was also the editor of the first newspaper of the Muntenian revolution, Pruncul Roman. He served with Nicolae Balcescu, Alexandru G. Golescu and Ion C. Bratianu as a secretary of the Provisional Government until the end of June. In August, he was appointed director of the Ministry of the Interior. After the bloody crushing of the revolution on September 13, 1848, Rosetti was arrested along with the other leaders of the revolution. His wife's intervention was crucial in their release. Rosetti, along with the Bratianu brothers, Balcescu, and others, went into exile in France. While in France, he published a review favouring the creation of a national unitary state. He is initiated as Freemason in a French Lodge, in 1845. In 1861, he returned to Romania, and was elected deputy, and in 1866 was minister of public instruction. Between 15 July and 16 July 1866, he was the temporary Prime Minister of Romania. He supported the deposition of Alexander John Cuza in 1866. He headed the Chamber of Deputies in 1877, and was Minister of the Interior between 1881 and 1882. A street (Strada C. A. Rosetti) and a square (Piata Rosetti) in central Bucharest are named after him, as well as a high school.